Since our launch at the beginning of 2018, our goal has been to create an intelligent assistant that monitors your MarTech stack and identifies problems and anomalies your teams are missing. We chose messaging platforms like Slack to eliminate friction between analysis and action because that’s what the user base wanted. We started with Search and Social and then quickly added Landing Pages to support our growing list of customers. And coming in January 2019, Eletype will now support Email and Telephony. What an amazing year! It’s been busy, let’s take a look back on 2018! Q1 was a bit of blur, between January and March we were heads down trying to port our proof-of-concept into something that could reasonably pass as an MVP. We applied for a couple startup accelerators (Engage.vc and TechStars Atlanta), but we were understandably too early. Not to be discouraged, we submitted our application to the Slack App directory in March and we were approved in April! Just in time to be literally put on the map. 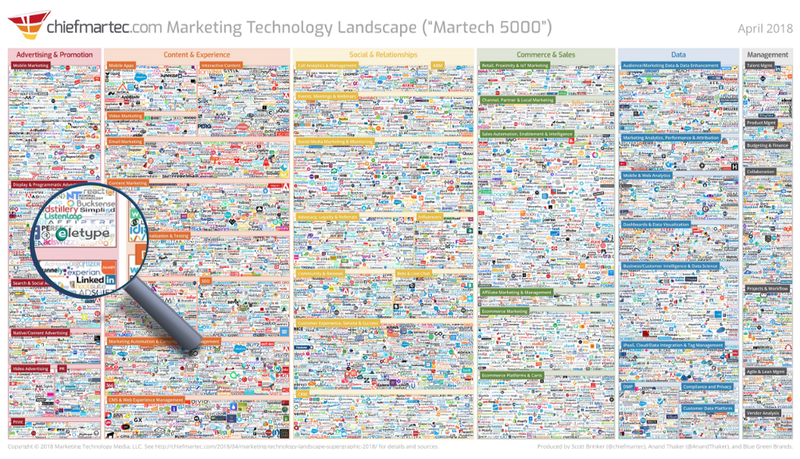 MarTech 5000 supergraphic! One of thousands! A humbling honor to be sure. Lessons Learned #1: Technical founders move fast but we tend to over-think and over-design things. Pro tip: Be like Facebook and move fast and break things. At about this time, we also became an ATDC Accelerate company. Our founding team has been in and around ATDC for the better part of the past 20 years. It will always be our home and it feels good to have our closet… I mean office! … here at ATDC. That coincided nicely with the Atlanta Innovation Week and the ATDC Showcase. This was a great event to get the word out about what we are building and also directly led to angel funding from a key Atlanta investor. Next up Atlanta Startup Battle! I don’t think any of us knew what we were getting into, over 500 startups applied, and after winning the first round followed by a long mentor day and a lot of prep for the finals, we were happy to be named one of the overall winners! This really kicked things off for us and provided our first real funding and little bit of credibility. Since that time we are proud to be members of the TechSquare Labs family. Meanwhile we were also on on-boarding our initial customers and learning a lot! Lesson Learned #2: Building in a messaging platform like Slack has the advantage of not requiring UI, but that means UX is really hard because of the constraints this limited medium has. We made some early mistakes right about this time in the early Summer of 2018, but thanks to our users, we got it dialed in. Pro Tip: No UI does not mean no UX. At this point there was a little buzz around town about what Eletype was doing and we were fortunate enough to get picked up in Hypepotamus, thanks Holly! — Marketing Teams Have Too Much Data, So Eletype Sends You What You Need to Know — Over Slack! By July we knew we had to start planning the full launch for what, up until this point, had been an MVP/beta release. We love what Ryan Hoover and the team at Product Hunt do, so we put our app up on Ship and used this community for feedback, support, and as our CRM and email marketing platform. Check out our upcoming page! Eletype Update #1 — What’s coming? 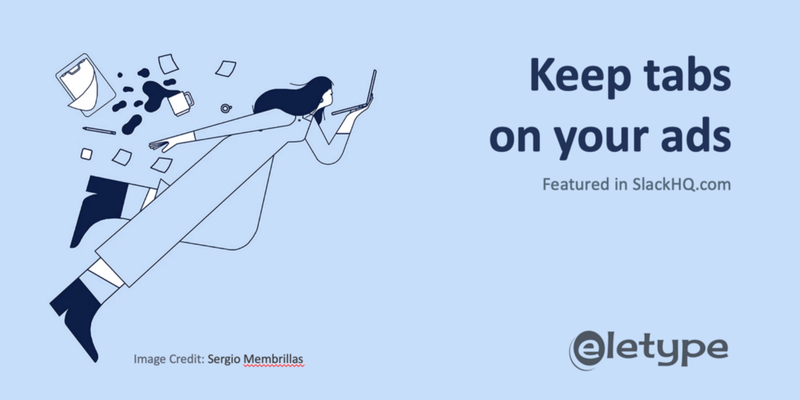 Eletype Update #2 — What is Campaign Monitoring? Eletype Update #6 — Holiday Surprise! Now that summer was well underway, we decided it was time for a west coast trip! We shared an AirBnB for a week while we exhibited at TechCrunch Disrupt and met with potential investors and partners. We also got to spend an afternoon with our most important partner, Slack! So what did we learn, as a Southern startup, out in the Bay Area? We wrote about it here: So you’re looking for the next Silicon Valley. Time for Atlanta to rise up. Not only were we learning a lot from our beta users, but we were starting to get noticed by some very large digital marketing agencies. In September we kicked off what would become a 4 month pilot with 360i. This would provide our team and technology with some significantly more complicated use cases. Lessons Learned #3: Is your bot too chatty? Too quiet? Turns out, at various stages in our early development, Eletype was too quiet and then too chatty. We didn’t know we had a problem until users were complaining about it. “What is it doing?” or “It’s too much.” Then we realized, we didn’t know because we weren’t measuring it. Pro tip: If you are building a messaging app, track the average number of messages sent to you users. We track it now and it is an important KPI for us to measure. 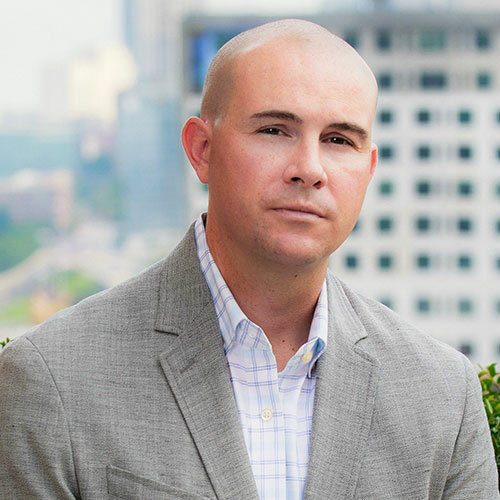 As October rolled around it was time for Venture Atlanta, the region’s largest and most respected venture conference. Read all about it here. It was a blast and connected us to investors and mentors that led to real results for us. We pitched 2 serious investors and gained an angel and advisor. Halloween brought us more treats than tricks with this great write up in SlackHQ! But things really got rolling in November as seeds that were planted earlier in the year started to beat fruit. Pilot projects with 360i were proving real results and partnerships with MailChimp, CallRail and HubSpot started to become real. We were also selected as hot startup to watch in 2019 by AmericanInno. 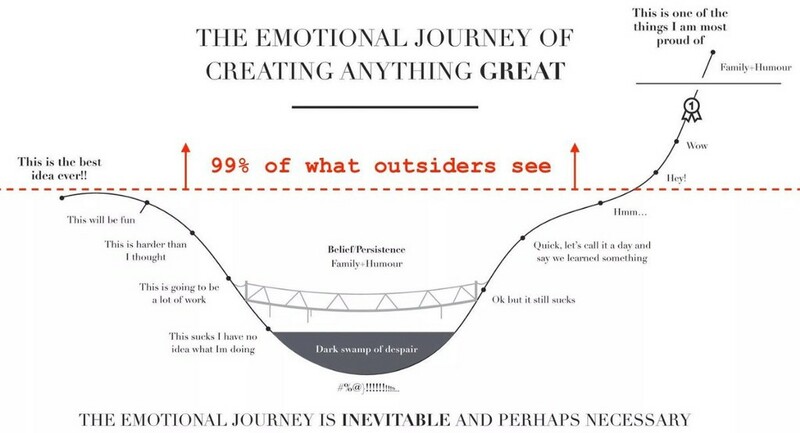 Lessons Learned #4: This emotional journey is real. It is very hard. Pro tip: Get up every day and tackle what is in front of you. Lessons Learned #5: Startup success is erratic, so is failure. Wins and losses come in bunches and are unpredictable. This can be incredibly frustrating emotionally and for team morale. Pro tip: Plant as many seeds as possible and know that most will not bear fruit. Here is the bright side, success does come in bunches and when you have a good week it will be the best week. We ended the year on a 3 week high. Full of deals, partnerships, launches and an awesome Christmas party! The team with our #1 angel investors. Family.